Elections for the Parliamentary and Assembly constituencies have concluded. All the political parties are in a state of anxiety. Even Narasapuram parliamentary candidate Naga Babu is in the same situation hoping for the best to come his way. He did a Facebook chat after the elections and here, is what he thinks. He is quite positive about the results hoping positive results for Jana Sena. If he wins the Narasapuram Loksabha Constituency, the sky would be the limit for him in developing his constituency. He said that he was overwhelmed by the response and love he had received from the people during the election campaign, and this love is quite different from the response he saw while campaigning for Prajarajyam Party, back then. Naga Babu was seen talking in length about caste and politics. He says that he was determined that the politics needs to be redeemed and caste equations must be completely away from the election scenario. 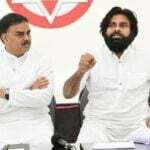 But, the sad part is that all the leading parties including Janasena, TDP and YSRCP allegedly approved the candidature for a constituency based on how strong he/she was with regard to their community equations. Hope, if Naga Babu wins, he would bring that change he has been promising.